빅뱅 지드래곤이 단독 콘서트를 통해 ‘아티스트’로 홀로서기 한다. 지난해 80만 관객을 동원한 빅뱅의 월드투어의 열기가 식기도 전에 이어지는 지드래곤의 콘서트는 ‘원 오브 어 카인드’(ONE OF A KIND)라는 타이틀을 앞세워 특별하고 유일한 공연을 목표로 한다. 서울 화곡동 스포츠월드에서 진행된 기자회견에서 지드래곤은 “과거에는 하고 싶은 것은 많았지만 내가 무르익지 않았다. 그러나 지금은 몇 년 후에 돌아봐도 촌스럽지 않은 세련된 모습을 보여줄 수 있도록 노력하고 있다. 좋은 사람들과 함께 해서 개인적으로 업그레이드 많이 된것 같다”라고 성장을 강조했다. 이번 공연의 주제는 ‘체이스(Chace)’다. 지드래곤은 오는 30, 31일 서울 올림픽 체조경기장에서 콘서트의 막을 올린다. 이후 전세계 8개국 13개 도시에서 26회 콘서트를 이어나가 55만 팬들과 만날 계획이다. 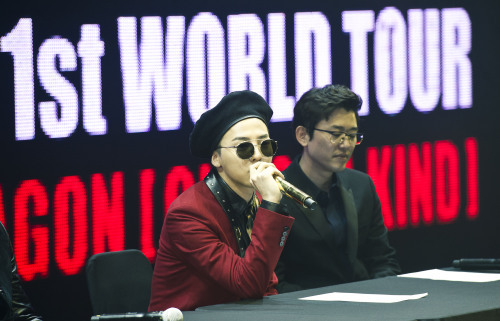 Big Bang G-dragon stands alone as an artist through the solo concert. The concert is following before cooling down of the world tour attracted by eight hundred thousand people. The title of the concert is ‘ONE OF A KIND’ and it aims the special and only performance. The topic of this performance is ‘Chace’. G-dragon raises the curtain of the concert at Olympic stadium in Seoul on 30, 31. After that, he’s planning to meet 5 hundred 50 thousand fans in 13 citie, 8 countries following 26th concert.